Amanda arrived in Guernsey full-time in 2000, having lived and worked in Germany, Holland, Scotland & Wales for the last 20 years amongst the realms of the RAF. 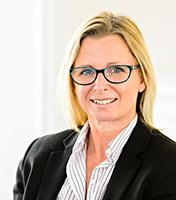 On arriving in Guernsey, Amanda pursued a career within the finance industry whilst studying Trust Administration. A career change in 2010 led Amanda to Court Row, specifically Probate and Estate Administration with another local law firm.